Tensions from Iraq invasion have brought strains "to the point of crisis"
WHO WAS BEHIND THE TERRORISM IN SPAIN? New Spanish Government To Shift Foreign Policy Away From U.S.
WHAT ROLE DID BUSH PLAY IN HAITI COUP? 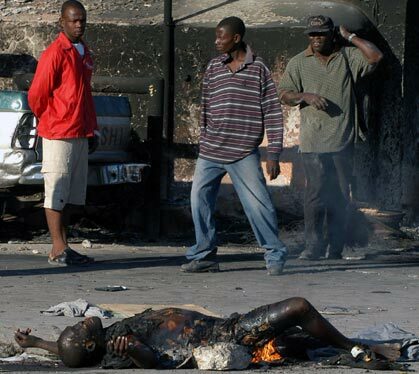 By the end of February, most of the country had fallen to the rebels who were now surrounding Haiti's capitol, Port-au-Prince, and waiting for the signal to attack. President Aristide refused to resign and leave, as the rebels demanded, but the 200 U.S. Marines who had just arrived in the city were calling the shots. In a tense 3AM meeting on March 1, they told Aristide he must step down. "What guarantee do I have that there will not be a bloodbath if I decided to leave?" He asked. Aristide says they forced him to sign a letter of resignation then forced him on a plane, leaving for parts unknown. 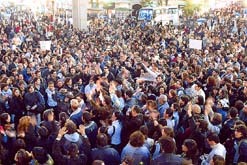 Hours later, the rebel army took the city. Cobbled together from anti-government gangs and militias and led by former army officers, it had achieved its aim of Aristide's ouster in a short three weeks. Among its leaders are former officers in the Haitian Army that overthrew Aristide in 1991 and that he successfully abolished after U.S. forces returned him to power in 1994. Other leaders included men who were in the top ranks of FRAPH, a paramilitary group that conducted a reign of terror against suspected Aristide sympathizers during military rule. Was Demand For France Reparations A Factor In Haiti Coup? Did Aristide Fall, Or Was He Pushed? Was Aristide Despot Or Humanist? Al-Hurra "short on credibility and long on arrogance"
Where Is The Investigation Of My Daughter's Death? Why Do Few Women Run For Office? Is John Kerry a captive of Washington "special interests" or is it another case of the news media crafting a misleading theme? IS KERRY REALLY A PAWN OF "SPECIAL INTERESTS?" The GOP has already began the portrayal of Sen. John Kerry of Massachusetts as a captive of Washington "special interests." 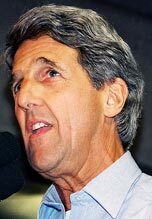 This theme has been gaining momentum even though Kerry ranks as a leader in the Senate in supporting environmental causes and is best known for his investigations into foreign policy scandals, such as drug trafficking by CIA-backed Nicaraguan "contra" rebels, not for pushing through corporate-favored legislation. So what gives? Is this a fair charge against the Democratic front-runner or is it another case of the news media crafting a misleading theme? Israel's assassination March 22 of the spiritual leader of the Hamas militant Islamic organization, Sheik Ahmed Yassin, has sent shockwaves through the international community. 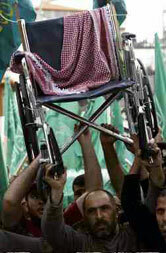 The 68-year-old Yassin was a quadriplegic confined to a wheelchair following a childhood accident and spoke habitually in a labored whisper. Yet, it was a whisper that could rouse thousands of faithful to action. He was committed to the jihad, or holy struggle, against Israel, but nevertheless was one of the Muslim leaders who condemned the 9/11 attacks on the United States. Israeli Prime Minister Ariel Sharon justified the assassination, calling Yassin "the first of Palestinian assassins," and reportedly directed the attack personally. 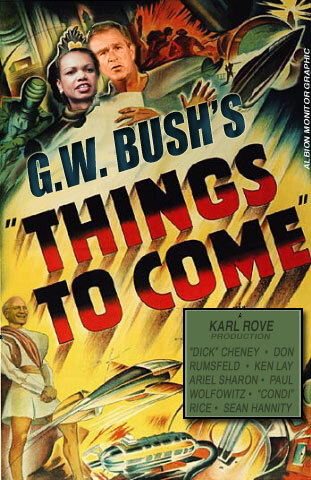 Bush stood behind Israel, and blocked a UN Security Council vote condemning Israel's use of assassination. Europeans were more critical of Sharon: "Images of a handicapped person tied to a wheelchair, being shot by missiles, is not the best way to improve Israel's security," said Poland's foreign minister. "They are not missing. We are only looking for them"
Did The U.S. Just Plant WMD "Evidence" In Iraq? And why hasn't the Western media even investigated the reports? Richard Clarke is hardly the only veteran national security expert critical of Bush. For 27 years, Ray McGovern worked as a CIA analyst, chairing National Intelligence Estimates and preparing the president's Daily Brief. "One would have thought that the raison d'etre for the Central Intelligence Agency was to prevent another Pearl Harbor," McGovern says. "One would have thought that the person most responsible for this would have been cashiered on Sept. 12. Not so. So the question is: Why not so?"